[By Nick, New for 2014] Time to review a limited edition flavor I somehow passed over last year but thankfully it returned again this year. Not sure why I exactly skipped over this one last year. 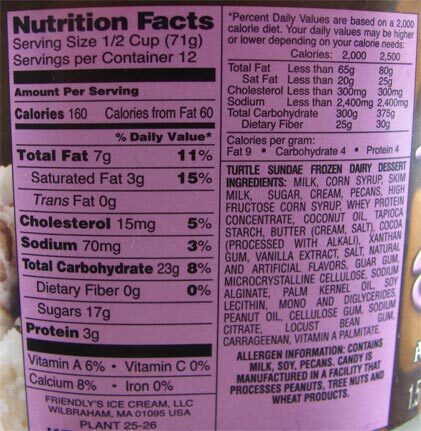 I mean just look at the turtle on the packaging. I would've bought this based on that face alone. I think it was the whole frozen dairy dessert component that had me pass on it the first time around. Their Red Velvet Cake made me a believer that they can make a decent fdd so here's hoping this one is up to the task as well. It looks as described. A decent amount of each mix-in are visible from the get go. The texture isn't too bad. ‎I've been eating so much super premium stuff lately that it takes a second to get used to. Friendly's fdd is still better than any of its competition which is a plus. The vanilla flavor is very mild. It's there but more as a background note. The caramel swirl does the same. It's just an added layer of sweetness and no real distinct caramel qualities. Thankfully there's an abundance of pecans and caramel filled turtles. 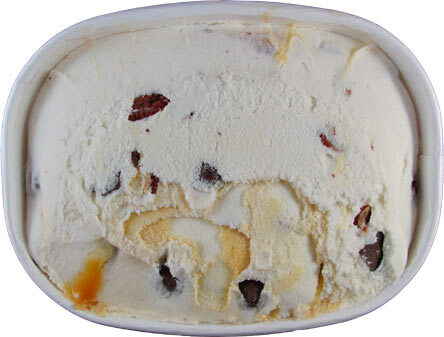 The pecans are halved for the most part and make their way into a majority of bites. They're your typical pecans which is never a bad thing if you're a pecan lover like me. The turtles as I'm calling them are tasty little gems. 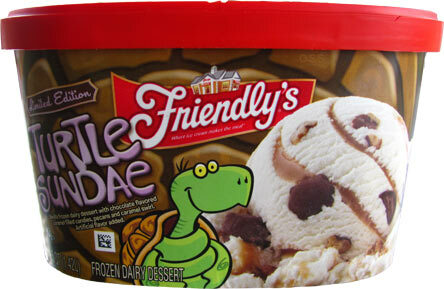 I know they're not officially called turtles but they look exactly like the other ones we've seen in other brands. Being chocolate flavored I was a bit hesitant but it's a good milk chocolate flavor and nothing artificial or too sweet. The caramel filling should replace the caramel of the swirl. This stuff is much better by a lot. 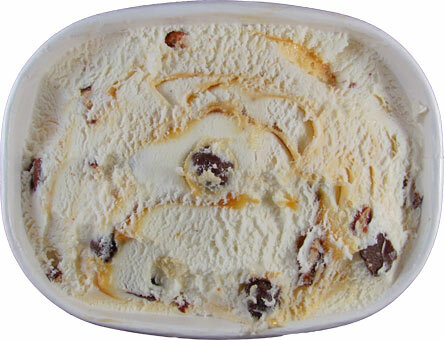 It's thick, gooey and has a strong buttery caramelized flavor. There was a point where I just went digging for turtles and pecans completely disregarding the base. Overall, this is an okay flavor. Definitely not something to go on a mission to find. If it's on sale, I say give it a shot. If anything, you can go deep container diving for turtles.